There were a couple of problems I was having with my printer, The process of taking a model and printer it didn’t feel natural, or convenient. There was also issue with my printer reliability. Don’t get me wrong, the printer worked well enough to see me through a hand full of project, but I was always left feeling that I just hacked it. The Reliability issues were due to me trying to cut cost earlier on the project. For example instead of the recommended NEMA 17 (40Ncm) I was using the ****, and instead of the GT2 belt, I used the T5. The T5 belts were at the time the cheapest belt I could get my hands on, that was a bad Idea. Due to the belt 5mm pitch and wider tooth, I was getting lot more vibration during the print which in turn had an effect of the quality of printed model. 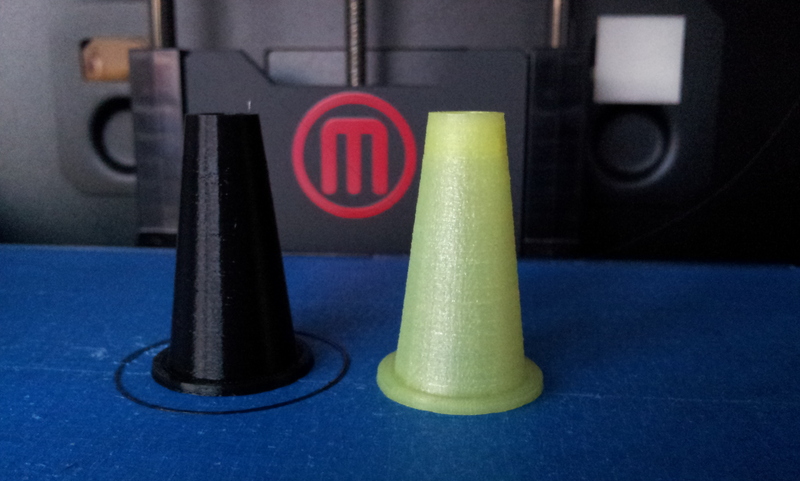 The models would look a bit rough (The yellow cone in the picture). the vibration were loud, it wasn’t deafening, but loud enough to put me off leaving printing overnight (Its a small flat!). As for the motor, I found that for the same current load they would get quite lot hotter (Around ≈85°C) and in my case the Y axis bracket warped while printing a 2hr model. I had to add a fan for each of the motors to make sure that they don’t over heat which in turn can have an effect the holding torque. They didn’t have enough torque in the first place so I had to slow down the printer to ensure that the motor had enough time to move and settle on to the correct steps, otherwise they would start skipping. 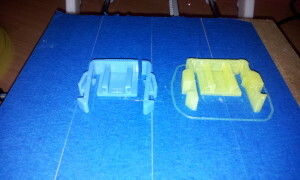 As you can Imaging, by upgrading the motor I was able to achieve faster prints and better overhang distances. the motors barely go up a few degrees above ambient temperature and because of this I also got rid off the FANS!… Win! One of the issue I was having is that I have a separate computer for running Solidworks to that controlling the printer. On top of that I was still using Pronterface. 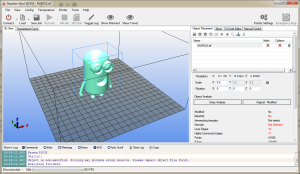 when you first start out Its a great software to use, Its basic and it gives you everything you need to control your printer and you can also use Slic3r with it. My problem is that at work the company has a Replicator 2 and with it you use Makerware. once I used Makerwaremy minimal standard for for this type of software was raised. My printer felt a little less convenient after that and so I used it less. It also didn’t help that between prints I packed the printer away to make room in the my flat (apartment for you Americans) . about a month of so ago I caught a post about matterControll which looked like a much better alternative to Pronterface. 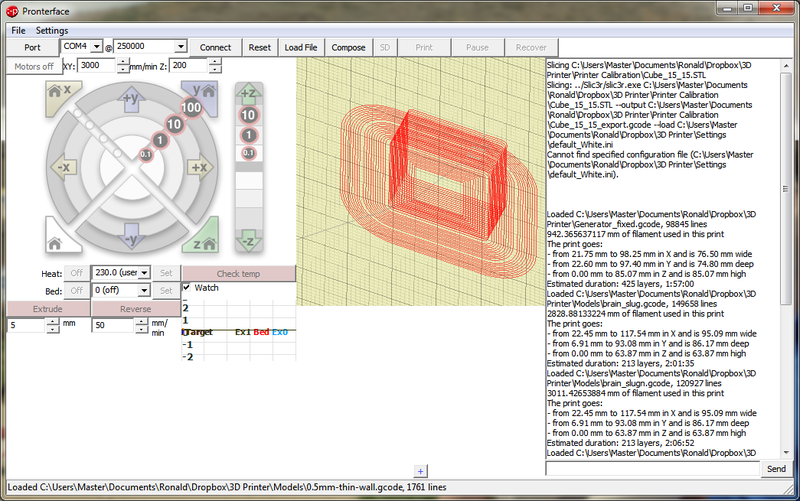 Unfortunately I haven’t quite got it working correctly on my macbook pro with slic3r, but I’ve not giving up. However, while playing with it I decide to Google for alternative and then I found Repetier and ultimaker’s Cura..
I’m still trailing those software but currently I’ve settled using Repetier which has made the whole process easier, a lot more fun. The interface isn’t as quite stream lined as say the Makerware or Cura. but It does allow me to still use Slic3r. 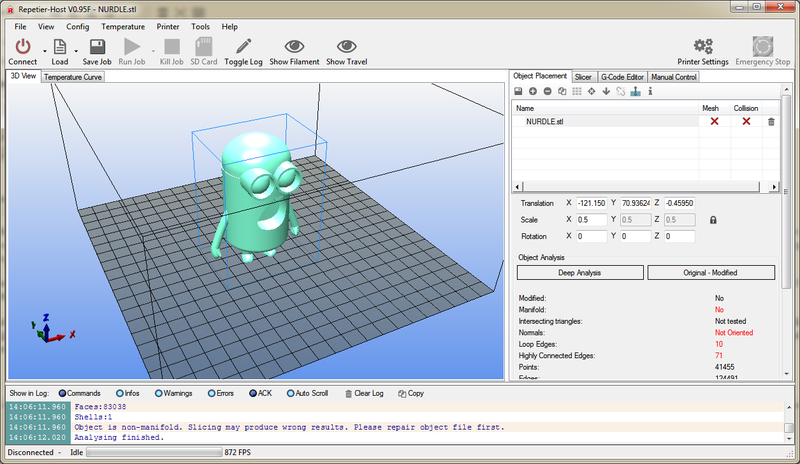 I also allows you to place a model into a virtual printing bed and place it where you want to print. However, I do find it a little annoying that it’s take you button click to after you places your model before it start to print (Press Slice then press Print). I’ve not really looked into it to see if it’s possible to get it to slice when you press the print button. There still plenty of changes I want to make to my printer which should hopeful make it even more reliable and fast at printing. I’m in the process of converting the extruder from a using a Wade’s feeder to Bowden. I want to add screen, and Micro SD card for autonomous printing. a heated bed to reduce the print curling. As I’m writing this post I’m still debating weather to make a second printer from scratch or just update the current. If your planning on venturing into the 3D printer world and don’t have the cash for something like the ultimaker or the makerbot and aren’t afraid of failure, then try building your own or put together kit printer. 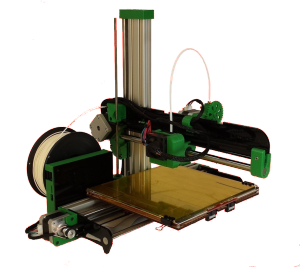 They are a lot of fun and plenty of people to help you along the way (Reprap Forum). 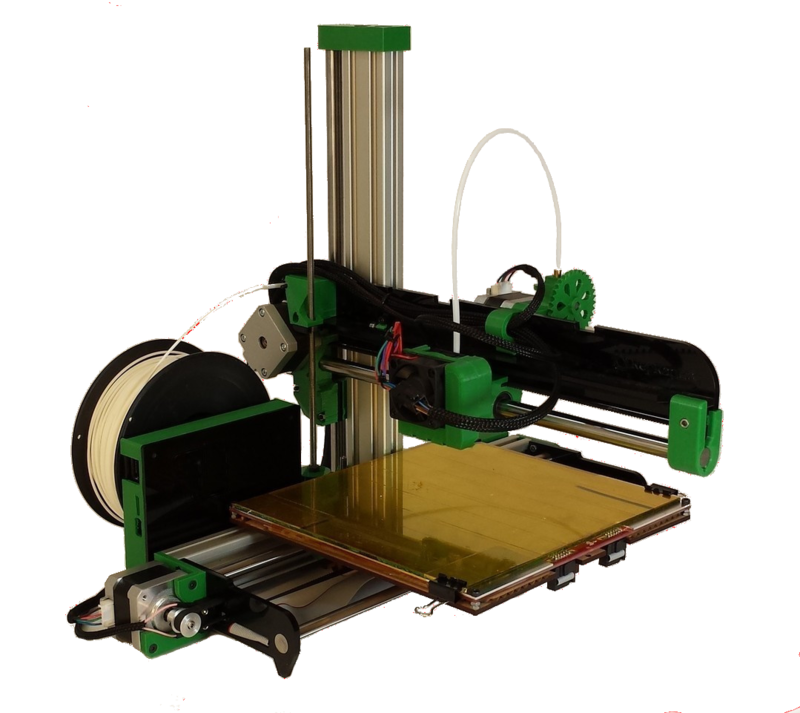 I highly recommended getting the Ormerod Kit printer from Reprap Pro. You will get a lot of features and room for expasion for £499 £599 (with VAT) You’ll find hard to find for this price.